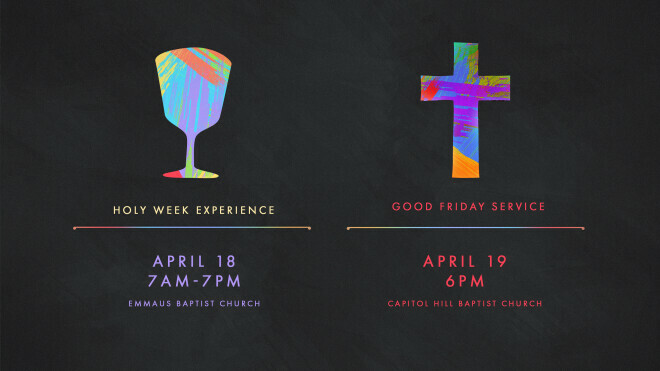 Holy Week Experience at Emmaus Baptist on April 18th from 7 a.m. - 7 p.m.
Stop by any time on Maundy Thursday at Emmaus Baptist for a walk-thru prayer experience that will help you reflect on the significant events of Holy Week which led to the crucifixion and resurrection of Jesus. Good Friday Service at CHBC on April 19th at 6 p.m. This service will be held at Capitol Hill Baptist Church. Come join us in the Worship Center to worship God as we reflect on the great salvation paid for us on the cross. This will help prepare our hearts for Easter Sunday.